Do not blame Mike Pence. In this week’s vice presidential debate Pence did the only thing he could. Wisconsin radio personality Charlie Sykes said it best when he described the logical outcome of years of attacks on the news media to Oliver Darcy, politics editor at Business Insider. “We’ve basically eliminated any of the referees, the gatekeepers,” he said, adding that now when Donald Trump says something outrageous and patently false, he’s expected to fall in line or be labeled a sellout. “At a certain point, you wake up and you realize you have destroyed the credibility of any credible outlet out there,” Sykes said. And, no, Sykes hasn’t gone full tilt. His statements weren’t intended to provide cover for the New York Times, which is considered by many conservatives to the be the most liberal of all news outlets. But he was alluding to the National Review and Weekly Standard, publications known for stalwart conservative thought, which have been pushed aside, diminished by those on the hard right who are turning to much more aggressive and pro-Trump outlets. He plans to write a book with the working title “How the Right Lost Its Mind.” I plan to be one of the first in line to get a copy, because I want to know how Trump and his ilk have manipulated otherwise good men and women. 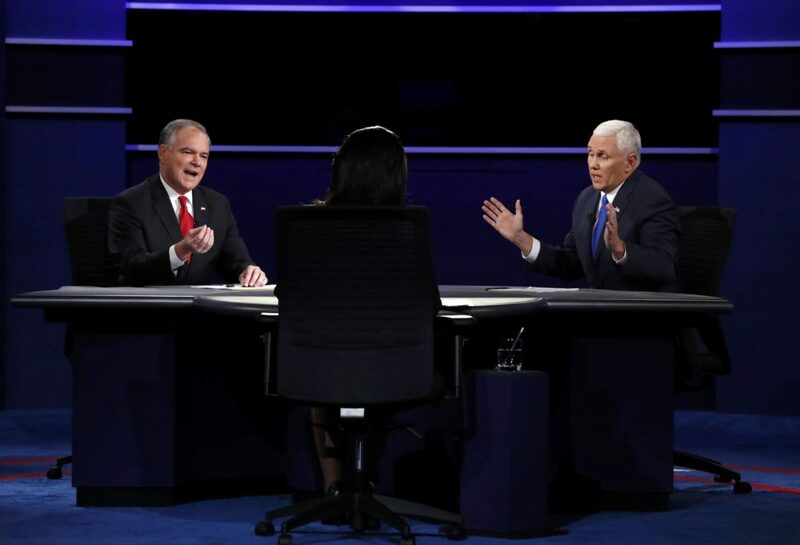 Which brings us back to Pence, Tim Kaine and the vice presidential debate. No one needed a political pundit to describe Kaine’s strategy. He wanted the man who has repeatedly described himself as “a Christian, a conservative and a Republican, in that order” to be confronted with some of the GOP presidential nominee’s most vile rhetoric. Kaine brought up the Indiana judge of Mexican descent that Trump labeled as unqualified because of his ancestry. He discussed the ugly birther movement that Trump led. He parroted Trump (and some Pence) statements on Russian President Vladimir Putin, nuclear proliferation and, of course, women. Kaine rightly pointed out that Trump promised in 2014 that, if he ran for president, he’d release his tax returns. He asked about Trump’s comparison of Social Security to a Ponzi scheme, and about Trump’s assessment that John McCain isn’t a war hero. And in response, Pence denied truth. He set his previous convictions aside and he lied. His only other alternative was unthinkable: Denounce not only his running mate but the credibility of the hard right conservative media, which is now calling the shots. So, don’t blame Pence. Having accepted a lead role in this work of fiction, he could do little more than read from the script forced into his hands. In this political climate facts are suicide, and Pence has never been a fan of climate change.